Technician and other Technician Jobs. interested for these vacancies can apply online through Bhavini website @www.bhavini.nic.in. Nigam Limited) recruitment 2017 see the information given below. 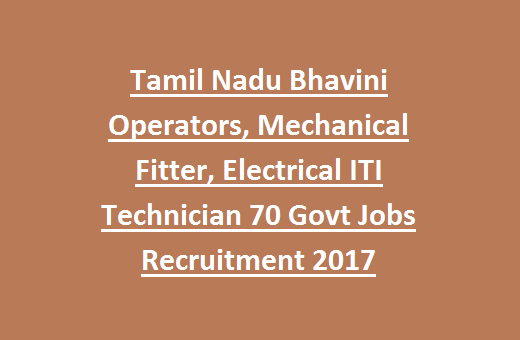 Click here to see the official notification of Tamil Nadu Bhavini Technician Recruitment. posts (OBC- 10, SC- 07, UR- 21). (Fitter- 10nos, Machinist- 2 Nos): 12 posts (OBC- 03, SC- 02, UR- 07). 05 posts (OBC- 01, UR- 04). posts (OBC- 01, UR- 01). 04 posts (OBC- 01, UR- 03). Level 4 Technician C posts is Rs. 25500/-. EEE/ ECE)or its equivalent from a recognized university/ Institute. on merit in written examination and interview.